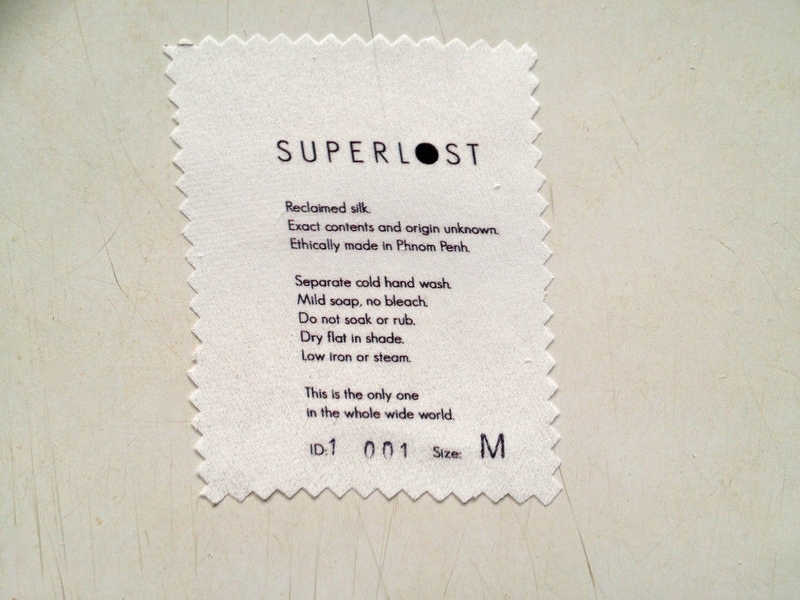 The idea behind Superlost’s label started simply enough – something printed on reclaimed silk to explain garment materials, production and care instructions. I discovered the local options are limited. 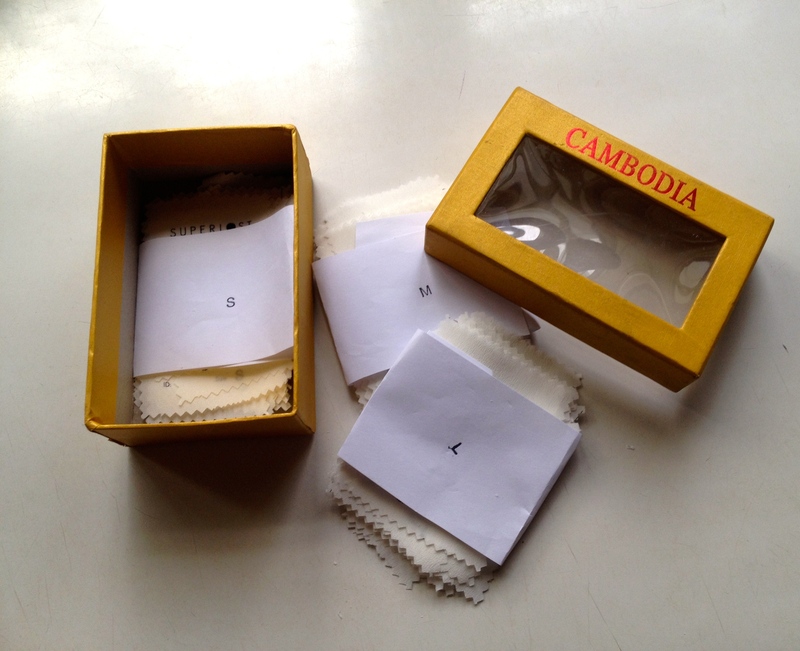 The Cambodian garment manufacturing industry is huge, but it’s mostly labor-focused which means most materials (fabrics, zippers, buttons, threads…and tags) are imported by companies for product construction here. 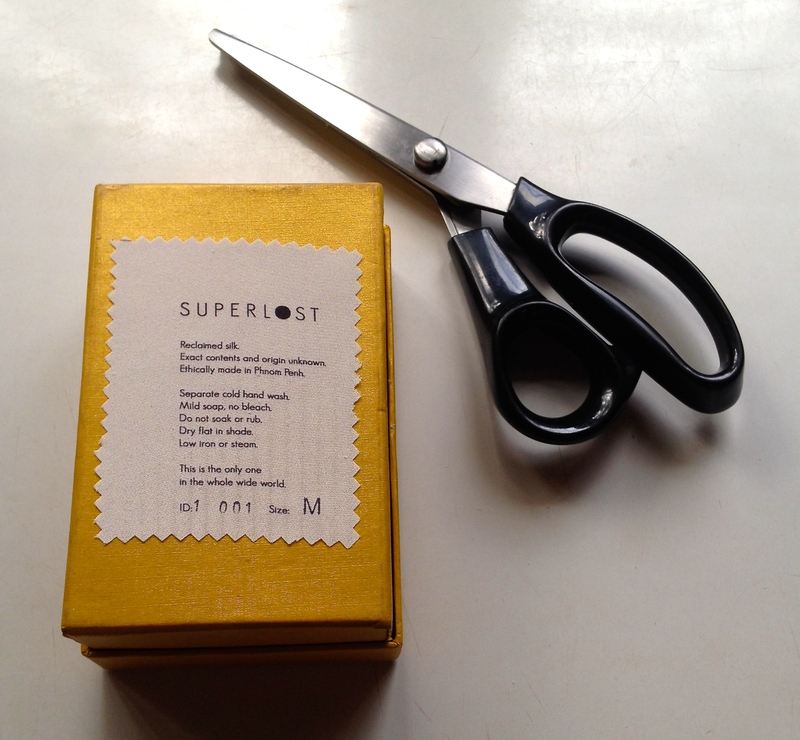 There’s only really two choices for locally-made labels: woven or screen printed. I didn’t want to use woven because they’re new and polyester. Screen printing, although lovely because it’s mostly done by hand here, limits typography detail and can be a problem when screening onto silk because silk can be slippery under the frame. So I had to look further afield. I heard about Frankie and Swiss through some friends in Melbourne. Their star performer is a digital printing machine called Florence. And Flo sure did the trick. Well, a whole bunch of people did tricks. Over six short days! It started with a test run at Frankie and Swiss and a few Skype calls with their wonderful staff; then an email to my graphic designer who interrupted her holiday in Portugal to adjust lettering, spacing and wording; then Florence did her thing (in just a few hours! ); my sister picked them up during her lunch break, Skyped me to tell me they were amazing, then dropped them off at a mate’s brother’s office; then Simon (my mate’s brother) flew to Darwin for a few days, before landing in Phnom Penh and leaving them at his hotel reception where I walked in to collect them. Sometimes things just work out, huh? GO TEAM. And universe. Nice timing, universe. So I spent an afternoon cutting the two metres of cream silk into 300+ little tags with my chunky pinking shears, and stamping S’s, M’s and L’s onto them. Each one also gets an individual ID number. This will help with logistics and stock inventory and it also clearly shows how unique every piece is. Only one of each in the whole wide world. PS – I was disappointed at not being able to source everything locally, but the precision of the printing helped me get over that, quick smart. Also, this run is on new silk, but I’ll have more time for the next ones so they’ll be printed on some of my deadstock crepe de chine. And, while the technology isn’t here yet, I’m sure it won’t be long till digital printing is available in Phnom Penh. Things move quickly in this city.